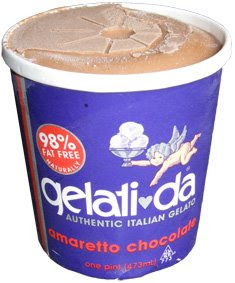 I love coincidence: The Ice Cream of the Month Club has inadvertently given me the most appropriate treat for National Ice Cream Day: Gelati-da, "the only true re-creation of THE WORLD'S ORIGINAL ICE CREAM®". gotta go, i'll right more later. Don't forget to eat ice cream today! --Ok, I'm back finally (it's Tuesday). Well, two subjects to cover: taste and texture ...wait, yeah, that was a pointless way to start this, but anyway. As I was having my second scoop, I had a thought. This tastes like a funky chocolate ice cream mixed with Dr. Pepper Topping. At this point, I realized I need to educate myself about what amaretto means in terms of flavor. I think it's an adult beverage ...yup, an almond-flavored liqueur, possibly with a mild bitter taste ...and apparently, it can be mixed with cola for a Dr. Pepper like taste. Wow, I guess my taste buds weren't messing with me after all. I can't say I love the flavor, but if Dr. Pepper is your thing, you're probably going to like this. Now, let's talk texture, well, actually, let's talk ingredients. I was quite confused by my Caio Bella experience, both by taste and by the fact that the fat content was so high. I thought gelato was suppose to be different, yet the milk and cream in Caio Bella's formula puts it up their with Ben & Jerry's and Haagen-Daz. Thankfully, I've learned the truth. "True" gelato is typically 8% milk fat, taken from, well, milk. the CB gelato is not the norm with it's high fat content (from cream). So, right here, you have an excuse to try true gelato: Gelati-da only has 7 flavors, and amaretto chocolate is the "fattest" of the bunch, but still only clocking in at 40 fat calories (2g from saturated fat). We can't eat super premium ice cream every night ...I mean, we can try, but we really shouldn't, not every night. Final thoughts: I can't say I would by this particular flavor again, I just don't love that Dr. Pepper tang that much, but overall I would say Gelati da has made me much more willing to try other gelati, both as a taste test and a healthier alternative.